This weekend I joined 30 food bloggers make our way through the Produce Marketing Association show in Anaheim, along with over 18,000 in attendance. A little overwhelming – absolutely! And who knew they had flowers as well! We were invited by The Idaho Potato Commission and were greeted by Don Odiorne, the Vice President of Food Service. In their booth they fed us daily with a lovely buffet, coffee, and lovely potato doughnuts! Must get that recipe- right? A big thank-you to Don and the several potato vendors we met throughout the weekend at the Fresh Summit Show! We met several authors during the show, these two lovely sisters wrote cookbook, Spork-Fed. Smiling away are Jenny Engel and Heather Goldberg. We also had a chance to view many pieces of machinery – including washing, sorting, and packaging of produce. At one point this could have been called a “truck show”. Old vintage trucks were a favorite picture stop for many! Food Trucks also made an appearance at the show and we ate tacos, mini burgers, and ahi tuna! Melissa‘s Produce booth was buzzing with two great L.A.Chefs, Susan Feniger and Mary Sue Milliken running the Border Grill Truck. Funny and bizarre costumes caught my attention as well, but so did the dried okra they sold! Movie stars appeared during the show, here Laura and I enjoying a foot rest in the Green Giant booth with Happy Days actor, Don Most. And my favorite picture in which I had to practically drag Laura to take with me are the Cranberry Guys! The Watermelon Commission invited us to attend a night of bowling and watermelon appetizers! Guess what? We actually did go bowling and ate all night long while we bowled two games! My partner in crime was Laura from Family Spice and we hit the floor hard and didn’t quit until are feet were so sore we couldn’t bowl anymore! So, where is the produce?? I will write Part II soon, and bring you all the produce you will ever want to see! ha! ha! 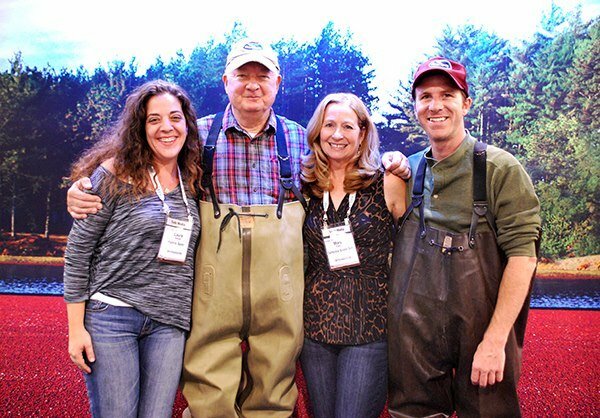 Yes, you did drag me back to the cranberry bog – and I’m so glad you did! Had a blast with you, Mary! Great recap of the experience! A wonderful photo experience from across the Pond 🙂 !